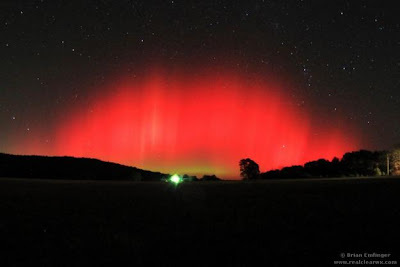 The southern states had quite a surprise this week when a coronal mass ejection from the sun lit up the northern night sky with a brilliant red aurora. On October 24, Brian Emfinger, a resident of Arkansas, saw the alert posted by Spaceweather.com and hurried outside with his camera to catch this image. "I ran out into the field and within a few minutes the aurora went crazy!" he said. More photos of the aurora seen in other states can be found at the Spaceweather website. Design an Experiment to Fly on The ISS! This stunning view of Saturn could not be seen from Earth. It is an image captured by the cameras aboard the Cassini spacecraft. The sun is located to the upper right, out of view, and the vertical bar to the right is Saturn's very thin rings. 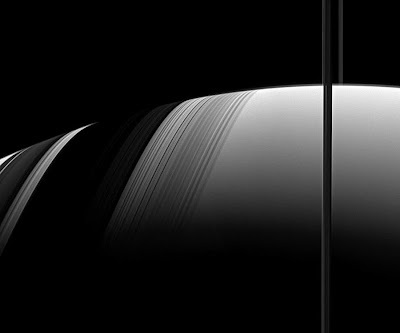 As the sunlight pours through the rings, shadows fall on the southern part of the planet. Just beautiful!